Universities and colleges are leading the way with innovative ideas to mainstream recycling and waste minimisation across their campuses. From promoting the use of reusable coffee cups and introducing biodegradable water bottles to reduce the use of disposables – enter King’s College London, to engaging student volunteers to coordinate daily collections of unsold food and make it available for anyone to take via a communal fridge and dry store – over to Lancaster University, the waste minimisation initiatives at universities and colleges are increasingly varied. The 2018 Green Gown Awards, which took place on Thursday 8th November at The National Railway Museum in York, celebrated the best in sustainability initiatives from universities and colleges across the UK and Ireland - and amongst the winners were institutions that are incorporating projects to reduce waste across their campuses into their sustainability strategies. Leading the way in this area is Sheffield Hallam University, winner of the Campus Health, Food and Drink Green Gown Award sponsored by TUCO. The University integrates a sustainable approach within all stages of its catering operations, from procurement to waste disposal. Key initiatives have included collaboration with the university’s Nutrition Course students to design and sell a range of healthy menus and recipes; and with the national social enterprise, the Real Junk Food Project to use food diverted from landfill. Sustainability plays a key part in the catering strategy with actions to minimise disposable packaging and food waste, including a bio-digester to reduce the overall food waste process - the first University to do so in the UK. Also taking on the challenge of food waste behaviour change is the Students’ Union at UWE which won the Student Engagement Green Gown Award. Their initiative - Bring Your Own Bowl (BYOB) - focuses on creating social networks through the shared enjoyment of free tasty surplus food. 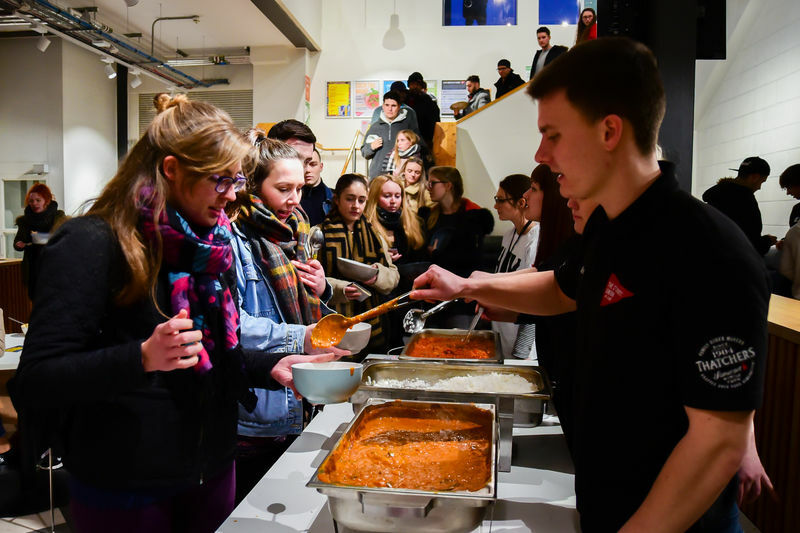 The SU runs events to engage students on key food waste messages and provide ideas for personal action and the name symbolises the fact that all students have to do is bring their own bowl. Institutions face a huge challenge in the summer term each year when students leave their halls of residence at the end of the academic year. The Student Community Partnership in Bath works with the University of Bath, Bath Spa University and Bath and North East Somerset Council and, for the third year in a row, joined up with the British Heart Foundation and their Pack for Good campaign for students to donate any unwanted items to fund their life-saving research. Both staff and students work diligently to promote the campaign. Last year, Bath raised £156,656 for BHF with over 10,000 bags donated! With the same end goal, The Great Donate is a campus-wide scheme run by Keele University which reduces the environmental impact from waste when students move out of Halls at the end of the academic year. The Great Donate began four years ago, collecting unwanted items to donate to charity, and has grown to collect food bank items for the Trussell Trust local food bank, clothing for the British Heart Foundation, and kitchen and household items that are made available for the following year’s incoming students to purchase. In 2017, £10k of donations were made to the British Heart Foundation, diverting 8.2 tonnes of waste and saving 8 tonnes of CO2. Tackling waste from a different angle, Elliott Lancaster, a student at Keele University, is running a start-up business called Utter Rubbish. The business, which won the Enterprise Green Gown Award sponsored by CUBO, focuses on improving rates and quality of Recycling and Waste management by offering improved recycling and waste collection information for household waste services users and a national fly-tipping prevention online reporting service. The software provides environmental, social and economic benefits to the community, local authorities and businesses. Utter Rubbish has actively combatted over £164,000 of recorded penalties in the pilot area of Newcastle-under-Lyme, through providing an easily accessible reporting system to students and residents. It's heartening to see universities and colleges tackling the issue of waste and behaviour change in such innovative and inspiring ways. You can read more about all of the projects above at http://www.sustainabilityexchange.ac.uk/2018x.